Welcome to the CDC Salmonella site. NOTICE: The information on this page is no longer being updated and may have changed. The information is accurate only as of the last page update. Since April, 1442 persons infected with Salmonella Saintpaul with the same genetic fingerprint have been identified in 43 states, the District of Columbia, and Canada. These were identified because clinical laboratories in all states send Salmonella strains from ill persons to their State public health laboratory for characterization. 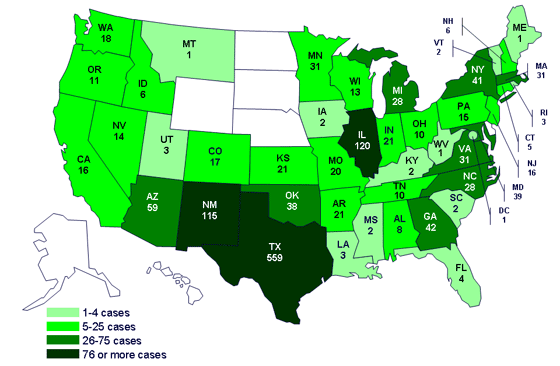 The number of ill persons identified in each state is as follows: Alabama (8 persons), Arkansas (21), Arizona (59), California (16), Colorado (17), Connecticut (5), Florida (4), Georgia (42), Idaho (6), Illinois (120), Indiana (21), Iowa (2), Kansas (21), Kentucky (2), Louisiana (3), Maine (1), Maryland (39), Massachusetts (31), Michigan (28), Minnesota (31), Mississippi (2), Missouri (20), Montana (1), New Hampshire (6), Nevada (14), New Jersey (16), New Mexico (115), New York (41), North Carolina (28), Ohio (10), Oklahoma (38), Oregon (11), Pennsylvania (15), Rhode Island (3), South Carolina (2), Tennessee (10), Texas (559), Utah (3), Virginia (31), Vermont (2), Washington (18), West Virginia (1), Wisconsin (13), and the District of Columbia (1). Five ill persons are reported from Canada. Four appear to have been infected while traveling in the United States; the travel status of the fifth ill person is unknown.